In conjunction with the ongoing exhibition Endless Shout, the Institute of Contemporary Art presents counts orchestrate, a meadow (or weekly practice with breath) by lead Endless Shout participant taisha paggett. This event is free and open to the public. Performances on Sunday, March 5 will take place in ICA’s galleries at 1PM and 3PM. taisha paggett and Meena Murugesan present a replica of a rehearsal over two days within the gallery. Though there are scheduled start times, the actions in the gallery will unfold over the length of the entire day, doubling up and building upon material sent and displayed at ICA by taisha and Meena from rehearsals in California prior to arrival in Philadelphia. This is a chance to spend time with and sit inside a process. Specifically, for this presentation, paggett and Murugesan are thinking along formal issues and relational questions raised by the Fred Holland and Ishmael Houston-Jones footage of Untitled Duet or Oo-Ga-La (1983) on display in Endless Shout, the January 22nd performance by Jumatatu M. Poe of Let ‘im Move You: A Study and This Is a Success, and Stan Douglas’s Hors-champs (1992) on view in The Freedom Principle: Experiments in Art and Music, 1965 to Now, particularly with regard to the duet. Over two days, time and breath and recurrence are offered via a tactile perspective that resides within, and is the power of bodies whose center is not male. taisha paggett (b. 1976, Fresno, CA; lives in Los Angeles and Riverside, CA) confronts issues of the representation of black bodies in dance through an interdisciplinary approach that connects the movement of performance with elements of visual art carried out in diverse types of spaces and formats. 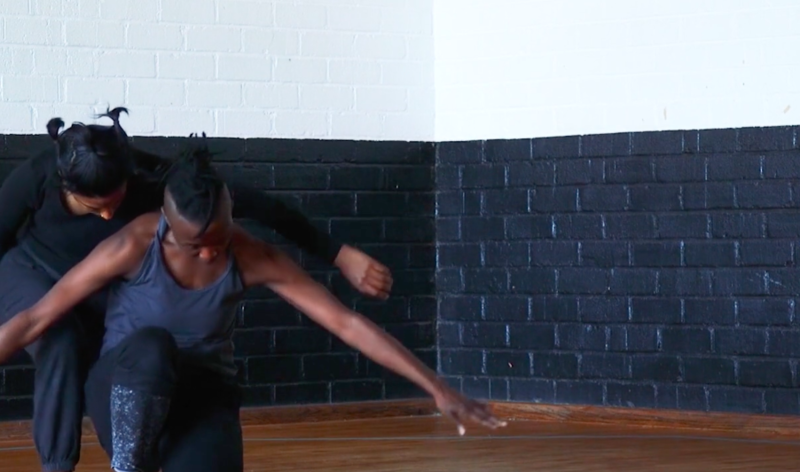 paggett’s solo and collective performance have been exhibited in numerous institutions, including Danspace Project at St. Mark’s Church (New York), Diverseworks (Houston), the Studio Museum in Harlem, Vox Populi, and the Whitney Museum of American Art for the 2014 Whitney Biennial. Her current ongoing installation and performance work, School for the Movement of the Technicolor People, begins from the question “What is a Black dance curriculum today?” She was the co-founder of the dance journal project itch, a former member of Ultra-red, and maintains an ongoing collaborative project with visual artist Ashley Hunt, “On movement, thought, and politics,” which has taken form as a workshop, performance, video, and mixed media installation. paggett’s oscillation between dance and visual art can be seen in her works such as Decomposition of a Continuous Whole (2009, 2010, 2012, 2016), LET’S USE THESE THINGS (2012) and Underwaters (we is ready, we is ready) (2014). She is currently an Assistant Professor at the University of California, Riverside. Meena Murugesan is a choreographer, performer, video artist, and arts educator. Meena creates experimental non-linear narratives with moving images at the intersection of live performance, video art, and activism. Meena’s movement practice is deeply rooted in bharata natyam, improvisation, somatic bodywork, and house dance. Meena designs projection installations for live performance, and is currently collaborating with Marjani Forte-Saunders, Sita Frederick, and d. Sabela grimes. Meena is a member of Post Natyam Collective, and taisha paggett’s WXPT. As an arts educator with over fifteen years of experience, Meena facilitates ethical filmmaking and movement processes with racialized youth, and criminalized communities as collaborative acts that hope to unpack stereotypes, stigma, and systems of oppression. Major support for Endless Shout has been provided by The Pew Center for Arts & Heritage.